Pie and salad feels wrong somehow. It should be accompanied with mash really. I know this and I know this well, having eaten over forty times* my own body weight in fluffy, bashed-up spuds over the years. Spuds that are usually accompanied by pies. And liquor. Oh lest we forget liquor. Beautiful, beautiful liquor. A pale gravy, most certainly. Flecked with bits of green, it is cloudy, mysterious and quite tasteless really, until you dump a load of malt vinegar and white pepper over it. However, I love that stuff and just typing up this is making me want to head down to Manze's right now. But where was I? Oh yeah, salad with pie. Is there a place for it? Well, until I visited MyPie.London in Broadgate Circle last week, the thought had never have crossed my mind and prior to that, I am sure I would have been firmly in the careful now, down with this sort of thing camp. But the sun was beating heavily upon my freckled brow that day and when Chris Brumby, chef proprietor of MyPie, asked what I wanted to accompany my steak, cheese and chilli pie, the thought of some cooling leaves and *gulp* watermelon seemed at the time, to be the only way to go. Still, it took me some time to actually order it, wavering at the hatch whilst wondering if ghosts of relatives were watching over. "Frank! E's 'aving rabbit food with 'is pie! Frank! Wake up!" And when I did finally blurt out my order, even Chris seemed to blanch at my request, making me want to snap "You're the one who is selling f**king salad with your pies mate." Bloody hell it felt stressful trying to decide. After handing some cash over (£6.50), the short walk to some lumps of wood on the concourse was slow and laboured and when I finally plonked myself down, a bead of sweat fell off my nose. I opened the carton and looked down at the pie, a perfectly formed pie at that, and then at the green rocket, before pausing once more and going in for the kill. The salad was quite good. Very good actually. 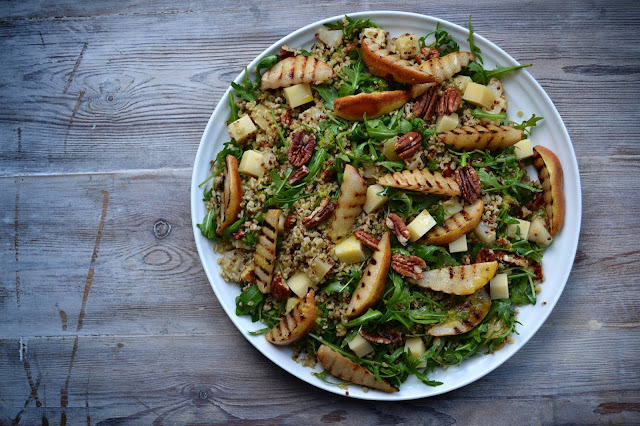 Dotted with bulgur wheat and dressed lightly, the little pink nuggets of watermelon complimented the green spikes well, serving up sweet contrast to the pepper. It was thankfully refreshing too. As for the pie of promise, well that definitely lived up to expectations. 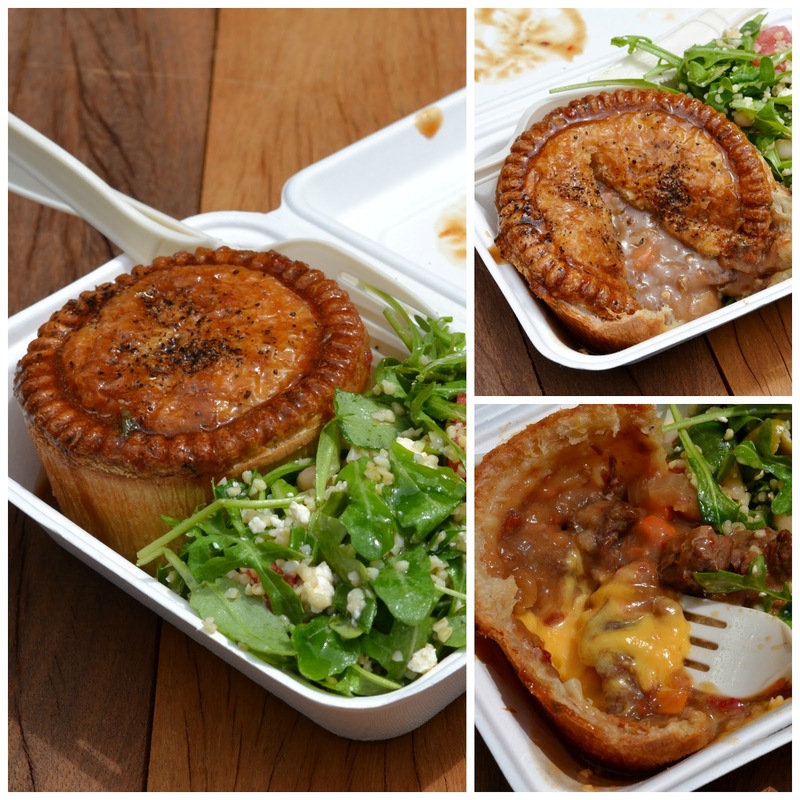 A fat laden, pastry parcel, entombing a well of tender beef, luxurious gravy and curiously yellow cheese is not a summer dish but one bite in and I was gone. Pies, when made with love, have the ability to transform and transcend you out of your surroundings and there have been many times when I have been lost in pie, up in the sky and this was no different. With lips coated and a bump back to earth, I only really noticed the faintest tinge of heat afterwards, which was fine by me. Anything higher on the Scoville scale would ruined the whole effort and most likely, would have seen this former ginger collapse into a puddle on the floor. Did the combination of pie and salad work though? It did. And I say that with gritted teeth, because I have got previous with Mr Brumby, having met him at the Great British Roll Off and have over the years, exchanged subsequent taunts about what constitutes a proper proper pie. But yes on a day like that, mash, however buttery, would have ended up all congealed in my gob, like dry cement in a mixer I am sure. Salad, on the other hand, was the right choice. 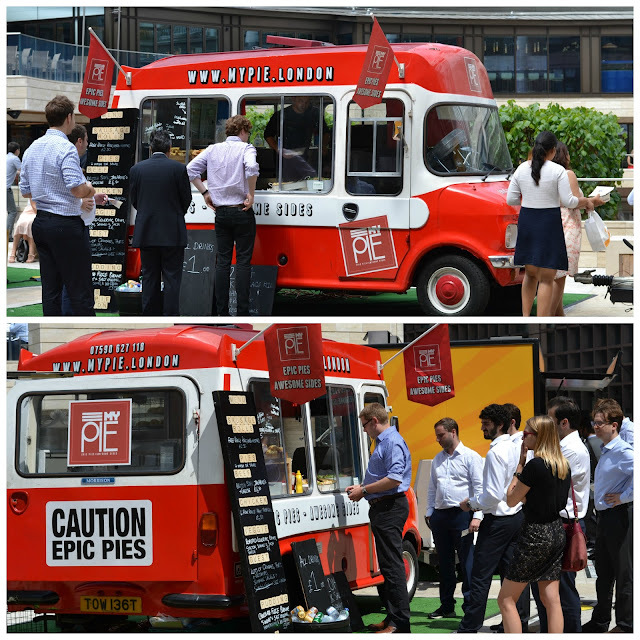 The MyPie.London van can be found popping up at various places, with various menus across town (keep an eye on its Twitter feed) and if you see that red and white former ice-cream truck, don't be afraid to try that salad suggestion with those deservedly named 'Epic Pies'. Come winter time though, it will be absolutely out of the question. *The mash to body weight calculation could be way off and on reflection, I think we best double it.